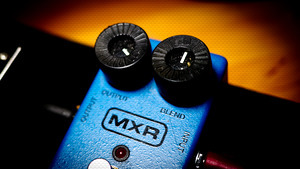 KitMonsters – MXR Blue Box. The music makers’ guide to making music. 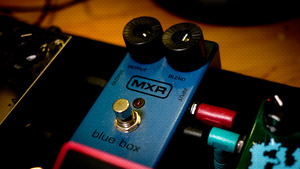 The MXR Blue Box is an Octave Fuzz that takes your guitar signal and duplicates it two octaves down for a huge, subterranean tone. It’s the crazy effect heard on Jimmy Page’s “Fool in the Rain” solo, and some people say it can make you sound like Muse. The Blend knob lets you control how much of the fuzz tone is mixed with the two octaves down signal. It’s used by artists such as Interpol, Paul Weller, Black Stone Cherry and You The Living.